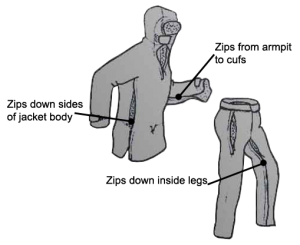 This page introduces my concept for Temperature Adjustable Clothing (TAC). 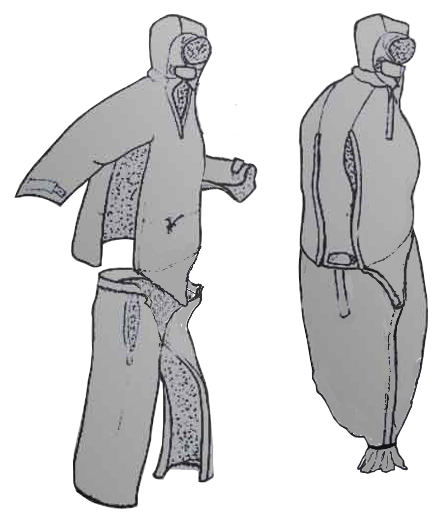 This is a radically new configuration of clothing which enables a single layer of clothing to adapt to a very wide temperature range and also convert into a sleeping bag. Some years ago, while backpacking, I started thinking about ways to make clothing more adaptable and multi-purpose. The layering principle has its virtues but removing my backpack to add or remove layers of clothing made me feel it wasn’t the ideal solution. I started thinking about the principle of wearing fewer layers of clothing but with better ventilation options to cope with a wider range of temperatures. 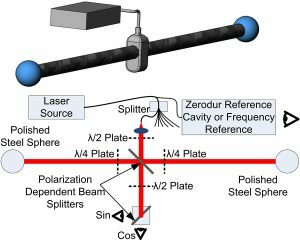 Buffalo Systems were an early example of this approach but I felt they didn’t go far enough with the idea. It seemed to me it should be possible to roll-away and compress unwanted insulation without removing a garment completely. This would mean a single layer of clothing which could give comfort in a wide range of temperatures without anything needing to be taken off or carried in a separate bag. What I came up with was a lightly insulated jacket and trousers, designed to be worn next to the skin and with zips along the major seams. The trousers have full length zips down the inside leg seams, the jacket body has full length zips down the sides and the jacket arms have full length zips from under the armpit to the cuffs. By unzipping the arms and legs they can be rolled away much more efficiently. 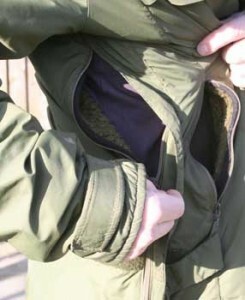 The zips down the sides of the jacket body provide further ventilation. When the jacket zips are fully opened out and draw cords at the waist are used to cinch in the material the jackets becomes a singlet of rolled away and compressed material, more like wearing a light pack than a jacket. 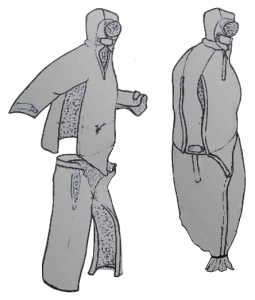 This clothing concept was already looking like a much better system for activities like ultralight backpacking and mountaineering but it also seemed to me that carrying separate cloths and sleeping bag was a waste. 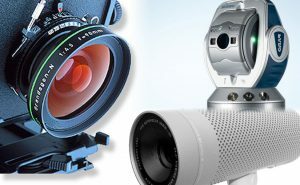 Essentially cloths and sleeping bag are just insulation material; it would be more efficient to reconfigure this into clothing or sleeping bag as required. I realized that the same configuration of zips that allowed the massive temperature range adjustment in the clothing could also be used to convert the TAC suit into a sleeping bag! The zips down the arms of the jacket and the sides of the jacket are the same length. 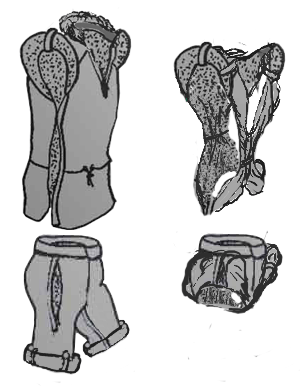 It is therefore possible to completely unzip these and reattach the zips so that the flattened arm zips into the side of the jacket increasing the diameter of the body. 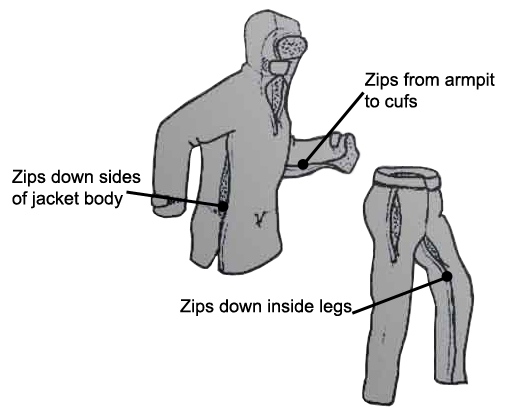 Similarly the zips down the inside of the legs can be completely unzipped and reattached so that the backs of the left and right leg are zipped together and the fronts of the left and right leg are also zipped together. The trouser legs then become a single large tube which can be sealed at the bottom with a draw cord. Since the jacket would normally be longer than the waist of the trousers, when the trousers are attached to the bottom of the jacket the overall length is increased. 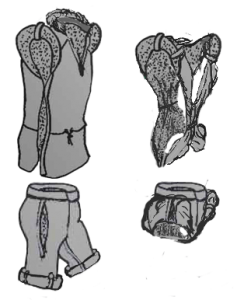 A triangular flap is folded down from the bottom of the jacket; this is then zipped into the fly zips of the trousers increasing the waist diameter of the trousers. I’ve had a go at making a TAC suit and got far enough to know that it works. All of the sizes work out just right so that the ventilation options work and the jacket and trousers become a comfortable sized sleeping bag. My sewing skills aren’t really up to making these complex garments work in a refined way. I don’t see this idea having any major commercial potential but it may be of interest to the “make your own” ultralight backpacking crowd. I’m therefore just putting the idea out there in the hope it will be of interest to others. If anyone does want to work with the design I grant my permission for others to reproduce and develop it freely provided credit is given to myself as the inventor and a link is provided to this page wherever derivative designs are published.